Where Travel + Street Meet. A personal and widespread look into the world of Street Photography. Learn about Street Photography and Travel the World through the eyes of Street Photography. Join me as I travel the world on different photography projects one city at a time. This what your Shooter Files Blog Ad will look like to visitors! Of course you will want to use keywords and ad targeting to get the most out of your ad campaign! So purchase an ad space today before there all gone! Award-winning Brazilian photographer Gustavo Minas makes discoveries where everything seems to be known already. On the streets of Brazil the master of light and shadows subtly turns his gaze on the everyday and the unspectacular and creates a new world with his pictorial language. The photographs collected in this book suggest a journey off the beaten track where my personal exploration of my native island is shared with you in the hope to leave you with an emotional understanding of the place more than a literal sense of location. Photography, contrary to the common belief, is not real at all. It is an illusion of reality with which we create our own private world. It’s impossible to objectively describe a place or the people who live there anyway. Every adjective suggests the opposite. Every description evokes a contradiction. In trying to document a specific place, to put it into context and to show what it’s really like, we photographers do not easily escape the traps of cliché and stereotypes. I hope that I have done my best to avoid them. Since this is a personal exploration, many aspects of life in the island have been ignored. I am more of an observer than an intruder. Still, through my photographs, I seek to create a world that is fictional in spite of being made with the raw materials of reality. Matt Weber has been shooting the streets of New York for the past 40 years, many of his images taken while running fares in his New York City taxi cab. His camera captures New York without pretense and with the love and attention that only a native could afford. Each image documenting the small yet extremely significant moments in the life of a city that never sleeps. Street Trip: Life in NYC is a compellingly curated collection of his finest street photography, an authentic look at daily life from someone who has consistently been ‘in the right place, at the right time’. His images are both timely and timeless and tell the stories of real life in the Big Apple in unfiltered and honest detail. 6 or 12 months of zines published by Tour Dogs. Subscription costs will not auto-renew. In an effort to get everyone access to the monthly zines, Tour Dogs is starting a subscription service. Zines are designed by Trey Michael Derbes and will now be professionally printed, featuring a variety of talented photographers. Follow @tourdogs for updates on new zines and free giveaways. The post Street Light : Photo Books and Zines (April 2019) appeared first on Shooter Files by f.d. walker. After Riga came major city #56 Almaty, Kazakhstan on the 100 City project. I’ll be discontinuing the 33 photos series on the blog soon, but I’ll explain why along with exciting details on something new I have planned in an upcoming post. For now, though, I’ll share a couple more additions of this long-time series here on Shooter Files. For more info on Almaty, be sure to check out my first impressions from a street photographer’s perspective. And stay tuned for one of my City Street Photography Guides to Almaty. Have you photographed Almaty before or do you plan on it someday? Let me know about it in the comments below! And let me know which photos you like best too! The post 33 Street Photography Photos from Almaty, Kazakhstan appeared first on Shooter Files by f.d. walker. *A series of guides on shooting Street Photography in cities around the world. Find the best spots to shoot, things to capture, street walks, street tips, safety concerns, and more for cities around the world. I have personally researched, explored and shot Street Photography in every city that I create a guide for. So you can be ready to capture the streets as soon as you step outside with your camera! Riga is the capital of Latvia and the largest city in the Baltics. While it’s known by tourists for its old town, like other Baltic capitals, Riga has so much more interest offer. Starting with the most Art Nouveau architecture in the world in the center, you can also explore the unique Moscow district, providing an edgier atmosphere filled with character. There’s a relaxing Eastern European vibe walking the streets here with a special character and edge that is all Riga. And with the also interesting Jurmala only a half an hour away, Riga is at the top of my list for a visit in the Baltics if you’re a street photographer. So here’s a Street Photography guide so you can be ready to capture all that Riga has to offer before you even arrive! After covering so many cities in Europe, I have to admit that old towns are getting a little old to me (pun intended). After so many, most start to look and feel mostly the same. The architecture, history, cobblestone streets and charm are undeniable, but they usually also become extremely touristic and polished in a way that makes the atmosphere feel similar to the next one. For visitors that haven’t experienced as many Old Towns, Riga’s isn’t a bad one, but if you’ve been to many, it doesn’t stand out too much, either. Saying this, it’s my personal preferences speaking. If you follow the blog or my work enough, you can see I like authentic, edgy, surreal and strange. Many prefer the beautiful and charming. That’s why Riga’s Old Town is where 95% of visitors spend most of their time. It’s charming with some nice churches, squares and cafes, but Riga has plenty of other interest outside this area. I explored the old town multiple times and it’s worth your time, especially if you like old towns and the touristic crowds, attractions and old charm they bring. But personally, Riga’s unique and authentic character is really found in the surrounding neighborhoods. Markets are always popular spots for street photography, but their not always my personal favorite. I’ll check them out because their guaranteed activity, but you usually get more of the same. Messy, crowded, bad lighting and an atmosphere that mimics the thousands of markets you find in every city. Sometimes, though, you find those special markets that are all their own and provide the perfect place for some street photography. The Central Market in Riga is one of those places. I’d put it in my top 10 for markets for a variety of reasons. First off, it has tons of space and lighting so it removes those 2 common market problems. It also provides a variety of markets and atmosphere for exploring. There’s a lot to see and you could spend hours shooting the whole area. The character of the market, including the characters you’ll find here, is what really makes it special, though. It has atmosphere to spare and everyday I came here, I found something new and interesting. It’s a very local feeling market, with a mixture of the city, including some of the rougher parts of Riga, which gives the market a little edge in areas. In addition to all the characters you’ll find here, you also see plenty of seagulls scavenging for meat, which adds another touch to the market life. This was the place I fit into almost every day in Riga because it never disappointed. Being the largest city in the Baltics means that you have more to explore outside of the old town compared to the other cities. This aspect of Riga was my favorite part about the city for street photography and the Moscow District was my favorite reason why. Now, locals and tourist books won’t recommend this district due to its shadier reputation, but I explored every bit of it solo on foot and never once felt unsafe. The character of this neighborhood takes you back in time, but not in the polished charm sort of way that the old town does. The feeling is much more real and authentic, especially in atmosphere. From the cobblestone streets to the traditional 19th century wooden houses, there’s a uniqueness to the old vibe the Moscow District surrounds you in. It’s more neglected here and can be quiet in much of it, but the character makes up for it. I especially like the look of all the deteriorated wooden houses with their large wood pane windows. Somewhat similar to haunted houses, I haven’t walked around a neighborhood quite like it anywhere else. It’s the oldest district in Riga after the old town, but provides an unchanged version. Yes, you’re guaranteed to see a few drunk people on the streets, and maybe even some drug dealing in parts, but overall it doesn’t feel dangerous. In my opinion, especially compared to neighborhoods in other cities, I wouldn’t be worried. And its more than worth any bad reputation it has for a street photography walk. Riga is famous for its Art Nouveau architecture and there’s no better area to see this than in the Central District. Later in the guide, I’ll go more into the world’s highest concentration of Art Nouveau buildings, but walking in Central you’re surrounded with this impressive look. It makes for a good area to just explore and get lost in, especially for street photographers that love architecture. It’s also the city center so you get a very local, urban vibe here with plenty of pedestrian activity. The unique Riga atmosphere helps make it an even more enjoyable walk too. I’d recommend just exploring away around Centrs, but some spots worth noting are around the KGB Museum and Miera Iela, which translates to ‘Peace Street.’ Miera is known as the hipster neighborhood in Riga, with art galleries and artsy cafes, boutique shops and bars. It’s older, wooden buildings, cobblestone streets and green areas provide a nice spot to explore, especially if you’re into that hipster scene. For me, the center of Central, where you’ll find the highest concentration of Art Nouveau was my favorite area to explore for street photography, though, outside of the Moscow District. Just north of the Old Town, dividing it from the Central District, you’ll find City Canal (Pilsetas). Surrounding this canal is a lengthy park called Bastion Hill. This wide green space provides some of the more picturesque exploring you’ll find in Riga, or any city. Locals come here to relax and stroll the many pathways along the canal and park. You’ll also find memorials, sculptures, benches and more mixed in. The most famous and popular spot to gather is around the Freedom Monument, located right in the middle of it all. This paved walkway attracts the crowds walking through the city between the monument and Laima Clock, either heading down to the Old Town, up to the Central District or walking along Riga’s central park. Other parks, including Vērmanes garden and Park Esplanāde are nearby to the north in Centrs too. Kipsala is a small island on the Daugava river across from the Old Town. If you want a nice view of the Old Town, it’s a good spot to walk, but it also provides some of Riga’s interesting older wood architecture and mix of past and new, as it’s become a prestigious neighborhood to live. You’ll some older fishing boats and a nearby beach, but while it can make for a scenic walk, it’s usually pretty quiet for street photography. Still, it’s worth mentioning for many photographers. Riga has the highest concentration of Art Nouveau architecture in the world. In the city center, it makes up around one-third of all the buildings. Before knowing this, I started exploring the center with my camera as soon as I arrived and it felt like I was surrounded with this old Art Nouveau atmosphere. It makes walking the streets enjoyable and gives Riga its own charm. I ended up getting lost in the center the first day and didn’t mind it a bit. Around every corner was this character that made Riga stand out, and this style of building was definitely part of it. In addition to the impressive Art Nouveau surroundings, Riga also mixes in old wooden buildings that give another signature atmosphere when exploring the streets. For street photographers that enjoy architecture, Riga would make for an interesting destination. The Moscow district might not have the best reputation, but it’s full of character made for street photography. It feels older, unpolished, authentic and filled with its own atmosphere. Exploring its streets, from the busy Central Market to the quiet neighborhoods, there’s an interesting vibe throughout. The old wooden houses and cobblestone streets help this vibe, but it’s more than that and something you have to experience for yourself. There’s a real edge, without feeling dangerous. And the amount of characters here, especially around the market, really complete this photogenic energy. During my 100 City Project I try to spread it out, not only to cover most major cities, but also to cover most regions. So, I knew I wanted to include at least one major city in the Baltics. I might include another in the future, but I chose Riga first because it’s the largest city in the Baltics, while the others are somewhat small to call a major city. I also chose it because research gave me a feeling that it had the largest variety of life and character to explore. While many tourists will pick Tallinn for its charm or Vilnius for its atmosphere, Riga looked to provide more for street photography and layers of life in the Baltics, in my opinion. Luckily, my feelings proved true and Riga ended up providing even more of what I was looking for. Riga has a very interesting atmosphere throughout the city. It’s so much more than its Old Town, which isn’t as true for a city like Tallinn. The old wooden buildings, all the art nouveau architecture, the mix of touristy and local, and all the characters you find outside of the Old Town make for a more complex and interesting city than I expected. There’s some very unique characteristics found here along with more variety than you’d expect for a city its size. Speaking from a street photographer’s perspective, Riga should be a nice surprise. *As always, no place is completely safe! So when I talk about safety, I’m speaking in general comparison to other places. Always take precaution, be smart, observe your surroundings and trust your instincts anywhere you go! Riga is one of the safest capital cities in Europe, especially when it comes to violent crime. You can feel safe freely walking just about anywhere in the city, with crime stats that back this up. Some locals warn about the Moscow District, but outside of harmless drunks and a seedier look, there’s actually not much to worry about here, either. And this is the section I’ve spent the most time exploring alone in Riga. So, overall, for a major city, you should have nothing serious to worry to about visiting Riga for street photography. Riga feels right along average for street photography in Europe. It’s not especially photo friendly like Asia, but most people just don’t care. Negative reactions should be rare outside of a few “no’s” here and there, particularly around markets. In the Old Town, they’re used to tourists, but outside of this area they aren’t. So you might receive some strange looks if you explore much with your camera, but it’s nothing to deter you from shooting freely here. I love to walk everywhere and I love walkable cities. It’s one of my favorite parts of Europe because you find many of the best here. And Riga is definitely one of them. It’s not huge, but it’s still big enough to provide plenty of interest and exploration. I walked everywhere here, never taking transportation, other than to the airport (which thankfully is pretty close too). The old town can be explored very quickly, and from there you can head north all around the city center, or head east through the Moscow District. There’s not as much interest across the river, but it does provide nice views of the city. Some people recommend Kipsala, which I did explore. I found it too quiet, but it has some nice atmosphere. For the most part, though, I stayed on the main side of the river, exploring away on foot without a worry. Riga is perfect for it. An easy 30 minute train ride from Riga’s main station takes you to Jurmala Beach. For 200 years, even through the soviet days, this has been the seaside spot to come escape. The wealthy were especially attracted to it, but everyone comes today. Its trendiness is part of its character, providing an interesting change of scenery and atmosphere while in Riga. Lined with Prussian-style villas, the sandy beach fills with people of all ages when the sun is out. Many kilometers long, there’s a lot going along the beach with food and drink stalls to recreational activities. A few blocks in from the beach and you’ll hit Jomas iela, the main pedestrian street, lined with restaurants, shops and other entertainment attractions for visitors. It is touristy, but I’d highly recommend giving a day here with your camera if in Riga for a bit. There’s plenty of activity and interest with a unique seaside atmosphere in the Balkans for street photography. For some more inspiration, you can look through some of the work done in Riga by Magnum Photos photographers here. And as always, you can check out 33 of my photos taken in Riga. I hope this guide can help you go experience Riga… So grab your camera and capture all that Riga has to offer for Street Photography! If you still have any questions about shooting in Riga, feel free to comment below or email me! Click Here For More City Street Guides! The post City Street Guides by f.d. walker: </br>A Street Photography Guide to </br><b>Riga, Latvia</b> appeared first on Shooter Files by f.d. walker. Hey everyone, I have an exciting announcement. Starting today, I have a limited run of prints for sale for a limited time. Due to a busy 2018, I was unable to hold my annual New Year Print Sale, so I’ll be holding a Spring Print Sale for this year’s edition (a selection of images never available previously). I hold these limited print runs once a year for one week so there won’t be another chance after the week ends. Most prints are only 1 of 1 so first come, first own. They all run in a 11″x14″ (28x36mm) size, but this year will be the first time I’m also running a few at a larger size of 16″x24″ (41x61mm). I’ll gift a free signed 8″x10″ for every 2 prints ordered (or 1 larger) as an extra thanks. They’ll never be available again in this size and print, or at this price. They all come signed and numbered on the back (shipped in protective packaging). Sale will only be going for a week before I get back on the road again for the year to finish off my 100 major cities project. Get them while you can and thanks for looking! The post Spring Limited Print Sale! 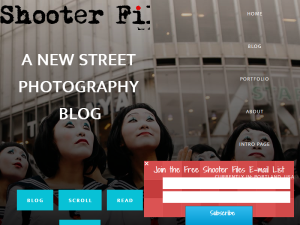 appeared first on Shooter Files by f.d. walker. * “Master Profiles” is a series profiling all the great photographers of uncontrolled life. Unlike the rest of the blog, I’m doing these in a straight profile format to make it easy for quick access to facts, quotes and knowledge on all the masters. I’ll also group them together here every time I add a new one. Australian photographer known for his way of capturing brilliant light showcasing his home country with a unique vision. Growing up in Newcastle, Australia, Trent started shooting at the age of 12 with his mother’s Pentax Spotmatic, while also using their laundry room as a dark room for developing the film himself. At the age of 13, tragedy hit when he witnessed his mother die from an asthma attack. While devastating, this traumatic event brought him closer to photography and admittedly effected his style of work. Parke began his career as a press photojournalist and worked for The Australian newspaper. In 1999, he self-published his first book, Dream/Life, which brought a unique vision in the way he captured life around him with brilliant light in a dreamy, contrasty style. Photographers Martin Parr and Gerry Badger said that it was “as dynamic a set of street pictures as has been seen outside the United States or Japan”. Dream/Life won second place in the 2000 American Picture of the Year Award for photography books and helped lead to his nomination to the prestigious Magnum Photo agency. In 2007, he became the first Australian to be invited as a full member of Magnum Photo, and is still the only member from Australia today. He has also been a member of the In-Public street photography collective since 2001. In 2003, with wife and photographer Narelle Autio, Parke drove almost 90,000 km (56,000 miles) around Australia, capturing a dark and melancholic portrait of twenty-first century Australia. This work was put together into his book titled Minutes to Midnight, which was awarded the W. Eugene Smith Grant in Humanistic Photography. Parke was also a multiple year winner in the World Press Photo Awards over this time between books. While this earlier work was all shot with black and white film, Parke has since also worked in medium format color, photographing his Australia in rich, saturated color, but with his trademark focus still on brilliant light. Trent Parke now lives in Adelaide, Australia. Trente’s earlier work was mainly shot with an M6 and 35mm lens, but he later switched exclusively to an Elmarit-M 28mm lens. As for film, Ilford FP4 had been his most used film. Since his black & white work, though, he has also started shooting medium format color with a Mamiya 7. Lee Friedlander, William Klein, Daido Moriyama and Josef Koudelka. The post Master Profiles: Trent Parke appeared first on Shooter Files by f.d. walker. After Seoul came major city #55 Riga, Latvia on the 100 City project. I’ll actually be discontinuing the 33 photos series on the blog soon, but I’ll explain why along with exciting details on something new I have planned in an upcoming post. For now, though, I’ll share a couple more additions of this long-time series here on Shooter Files. For more info on Riga, be sure to check out my first impressions from a street photographer’s perspective. And stay tuned for one of my City Street Photography Guides to Riga. Have you photographed Riga before or do you plan on it someday? Let me know about it in the comments below! The post 33 Street Photography Photos from Riga, Latvia appeared first on Shooter Files by f.d. walker. If you are the owner of Shooter Files, or someone who enjoys this blog why not upgrade it to a Featured Listing or Permanent Listing?